Income Based Repayment plans are only for federal student loans that are not currently in default (those who are in default can access them once they've gone through a loan rehabilitation period). At first, they limited your payments to 25 years and no more than 15% of your income; some now limit payment to 20 years and 10% income. What we have currently is a confusing tangle of IBR-type programs with slightly different names and terms depending on when you took out your loans. But with student loans a hot topic in Congress and the press, there is talk of making the better terms available to more existing student loan holders. To see where you stand right now, check out IBR Info's very helpful site. There are plenty of private banks ready to help you refinance your student loans by moving your debt over to them. Given the ridiculously high fixed interest rates on many of our federal student loans, this could be a great move. Unfortunately, you have to qualify for the new rate with a private lender and, in many cases, end up paying origination fees or variable interest rates that will go up later. More disturbingly, you lose the protections offered by federal loans. Recently, some of our Members of Congress have suggested that the Fed's should also be refinancing—going back to lower the rates for students paying far more than if they had borrowed under recent loan programs. So far, this hasn't worked, but with some loan holders paying 8.5% for 20 to 30 years while others pay only 6%, our current system raises questions about just how fairly the government is treating its students. How much are you paying? There have been rumors around for a long time that it is impossible to discharge student loans in bankruptcy. In fact, Congress did make it extremely difficult. And given the options for repayment available through federal consolidation loans, it would be hard to convince a bankruptcy court that your federal student loans are an undue hardship that can't be addressed except through bankruptcy. But this argument doesn't hold for private student loans, and since 2005, private loans have also had the benefit of extra bankruptcy protection. The Fairness For Struggling Students Act of 2015 (S.729) would get rid of extra challenges to discharging private student loans in bankruptcy. The Student Loan Borrower Assistance site offers a good run down on what the laws are. This one is a long shot—but not as much of a long shot as it was even a few years ago. We seem to have reached unanimous agreement that we are doing now just doesn't work. Is the solution to make all student tuition costs into a form of IBR program? To follow the lead of Germany and other countries in which nationally funded higher ed programs are free? To tax the industries that benefit most from our higher education systems and use that to pay for undergraduate degrees? What is your idea for making higher education accessible to all Americans without leaving our country in debt? 1. Remember, Student Loan Debt Is Not A Moral Failing. 3. Pay Attention To Rates! Unless you were lucky enough to get a subsidized loan, those interest rates began compounding while you were in school. Once you've graduated, you might have some options for bringing them down. Check the rates on your current loans and note whether they are fixed rates or variable rates. Federal Consolidation Loans will average your interest rates from these loans, giving greater weight to the larger loans. Use the Department of Education's calculator to figure out what the Consolidated rate would be and ask yourself, am I better off now? In the long term? Most federal student loan programs, including federal consolidated loans, carry with them some great benefits that too many loan holders still don't know about. Do you work full-time for a government organization or nonprofit? Under the Public Service Loan Forgiveness Program, you could have the remainder of your debt forgiven after ten years of regular monthly payments. And that works even if you choose an Income Based Repayment (IBR) Plan (or the closely related Pay As You Earn Plan, Income-Sensitive Plan and Income-Contingent Plans) that sets your payments at a percentage of your income. For most students, the impulse is to get the loans repaid as quickly as possible. It's a good impulse and a financially sound plan. But it may not be realistic depending on your income and your loan size. If you are looking at a mountain of student loan debt and feeling defeated, make sure you have the right loan repayment plan in place and remember that your own circumstances will just keep changing, and so will the loan repayment programs. Find that balance between sacrificing for the future and making something great out of the present—after all, that's what your education has qualified you to do. *Parent PLUS loans can not be consolidated and do not offer special repayment terms. Perkins loans can be included in repayment plans after they have been consolidated with another direct loan. What Kinds of Student Loans? One of the most confusing things about our student loan industry is trying to figure out what kind of loans are out there. In fact, too many of you aren't even sure what you have ended up with after you've taken out the loans. It isn't your fault—our student loan offerings are a strange, piecemeal collection of programs that Congress has squabbled over for decades. Some loan programs (like Perkins) require that you be particularly financially needy. Others put your parents on the hook for repayment, rather than you (Direct PLUS for parents). Each program has it's own borrowing limits, most of which are not very high, so a lot of students will end up with a collection of many loans. 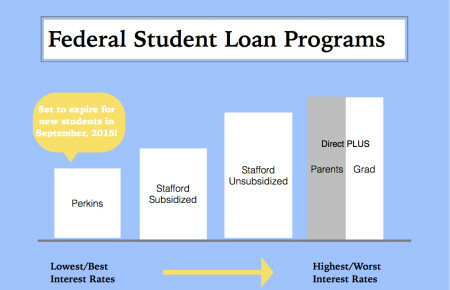 And since each loan program has different interest rates and terms...you get the picture. So what is a student to do? First, keep in mind that even in all of the confusion federally-backed student loans are a better deal than private loans from banks and credit unions. They generally come with better interest rates and with more flexibility for repayment. In most cases, your educational institution will try to put a package of federally-back loans together for you after you have filled out the FAFSA and related paperwork. They have a lot of practice at this, after all, but you will want to keep an eye on things to make sure you are getting the best deal possible. The chart below will help you figure out what you might qualify for and which loans you are hoping to get. Keep in mind as you look at it, that these are just loans—before you reach for these you will want to try for scholarships and grants (but more on that in a later post). What do you do once you have them? Read my next post, Wrestling Your Student Loans Into Submission. *The old Federal Family Education Loan (FFEL) Program has now been absorbed into the Direct Loan Program you see in the diagram. Student Loans: Who, How and How Much? With all of its graduations, May seems like an especially good time to attack the question of student loans and student debt. 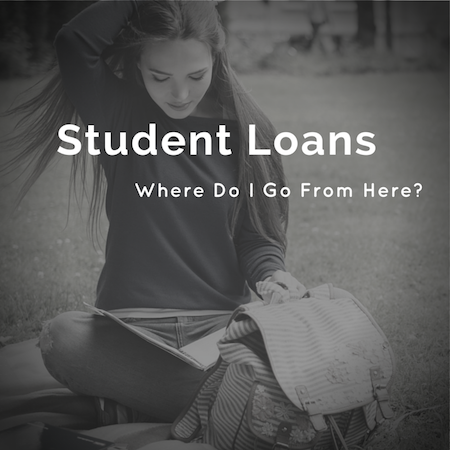 Whether you have loans, are taking out loans or are just thinking about the effect of student loans on our economy as a whole, this series will give you an introduction to the highs, lows and in-betweens of paying for higher education. Once considered a private issue for students fortunate enough to go for a degree, student loans in the U.S. have grown into a massive industry. That means they are now everyone's problem. Don't believe me? This 2013 Report from American Student Assistance laid bare the trends we have all been seeing: student debt is causing some of our most promising grads to put off home and car purchases, delay starting families and shy away from entrepreneurship. With even professional degree students struggling to cover basic purchases on top of student debt payments, it's fair to say that these loans mean grads are now less active in parts of the economy they once helped sustain. What's more, the growing costs of education mean that the numbers are really adding up. In 2014, student loan debt surpassed the total credit card debt and auto loan debt held by U.S. families. The Federal Reserve's May 2015 Report calculates outstanding student loan at a frightening $1.355 trillion. And if you want to join into the discussion, email with your questions, anecdotes, ideas and other comments!